It’s pet prosthetics celebration week here in the Tripawds Nation! Yesterday you saw part 2 of Bridget’s new prosthetic journey and today we are hoppy to announce a free pet prosthesis project for one lucky Tripawd, sponsored by PawOPedic™! 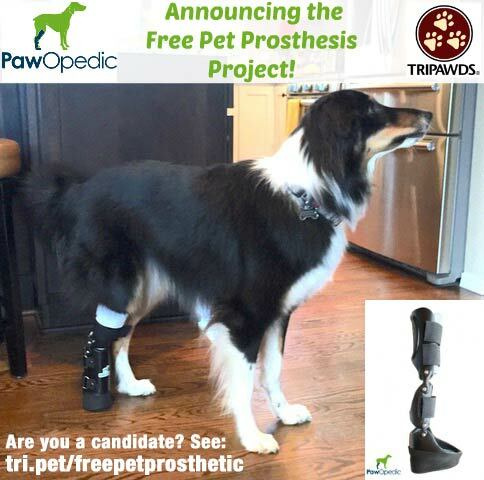 Free Pet Prosthesis Project for One Lucky Tripawd! Read all details before applying. A professionally made pet prosthesis is a beautiful thing. An animal can enjoy the four-legged gait they were born with, which helps decrease osteoarthritis pain and injuries caused by compensating on three limbs. But these devices aren’t cheap, which is why pet prosthetic designer Jeremiah Uronis wants to help one lucky Tripawd enjoy the benefits of a professional prosthesis with his Free Pet Prosthesis Project. Jeremiah is a board certified orthotist for humans and professional prosthetist for pets. As founder of PawOPedic™ in Seattle, Washington, he is actively looking for one Tripawd and their human who would like to commit to the free pet prosthesis project. The ideal candidate doesn’t have to live in Seattle to participate, they just need to have their veterinarian on board with the process. Read on for details about why Jeremiah is doing this, and what a pet parent can expect if chosen to participate. the Free Pet Prosthesis FAQs before applying. Why do you want to give a prosthetic away? We want to give a prosthesis away for two reasons. Our main goal is to help drive awareness of the field of animal prosthetics and orthotics. Animals get injured just like humans do and they deserve the same type of treatment options as humans whether that be therapy, surgery, alternative medicines, or braces and prosthetics when appropriate. We want to get more pets in our 3D printed feet so that we can continue to gather feedback and improve them since they are still relatively new. The traditional foot in the picture below was created from a firm foam material. While it provides a nice cushion for your pet it also absorbs energy with each step taken which can lead to fatigue. Ideally, we wan to harness and return some of the energy our pet expends for each step so they get less tired throughout the day. With our 3D printed feet such as the green one below we can do exactly that. As your pet steps on the foot it compress slightly and then just as their paw is about to lift off the ground it rebounds and pushes off the ground like a spring. This is exactly the same concept in high-end running feet that human paralympics that you may have seen or heard about. No now but likely in the future. Fabricating prosthetics for cats is quite challenging due to the size, hopefully over time we can scale everything down more easily. But for now it remains a challenge. What do you hope to gain out of it for the dog, the client, and you? From an awareness standpoint we would like to document the process from beginning to end so that pet parents can get a better idea of what we can do with prosthetics and how it is done. And anytime we can help restore mobility to pets we are happy. How long of a process is it? The process usually takes 2-3 weeks. The first step is to work with your veterinarian to see if a prosthesis may be a good fit for you and your pet. 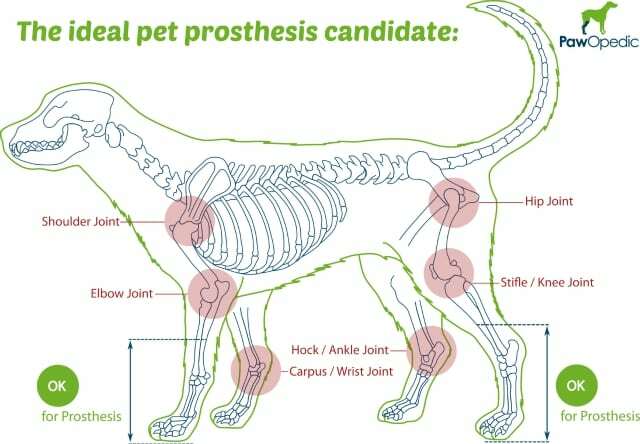 Once we have determined if your pet is a good prosthetic candidate the next steps would include having your veterinarian taking a cast of your pet’s residual limb, us fabricating the prosthesis, and finally having your work with us to fit the device and make any needed adjustments. Image copyright PawOPedic.com. Click image for FAQs. What kind of materials will it be made of? There are a lot of different materials that go into a prosthesis. For the main body the prosthesis we use a very resilient copolymer plastic that is lined with a soft durable foam liner. The 3D printed feet are comprised of various blends of flexible plastics such as nylon. Finally, to keep the prosthesis on we use different types of elastic strapping and Velcro. Are there any expenses that I can expect once my dog is using the prosthetic? Are there upkeep and wear and tear costs? Will he need a new one in the future? Yes, we recommend that your dog wears a thin seamless sock on their limb before donning the prosthesis. This helps protect the skin and also keeps the prosthesis clean. A well cared for prosthesis can last several years, however, some components such as the straps and tread along the bottom may need to be replaced. Depending on use, the actual 3D printed foot may need to be replaced over time. to discuss with your veterinarian before applying. Still have questions? Contact PawOPedic. 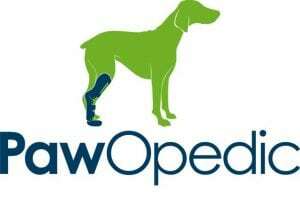 Read all Tripawds articles about pet prosthetics.